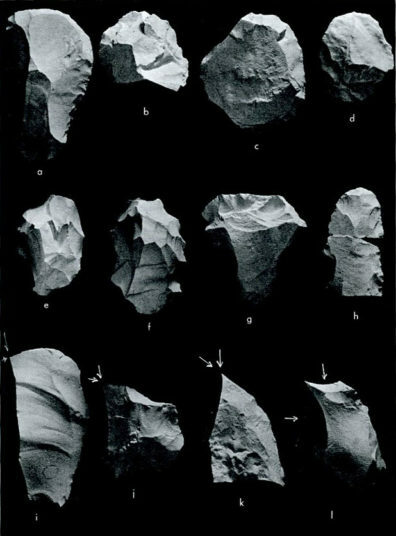 To understand the cultural chronology at Granite Point, Leonhardy (1970) designated cultural components by first correlating artifact assemblages with the geological strata they were found in and then comparing the content of each of the stratigraphic assemblages. Leonhardy used the distribution of artifact category commonalities between stratigraphic assemblages to determine if they consisted of different sets or could be collapsed into a single set. This was done by comparing the size of the proportion of the commonalty between sets to the size of the proportion of uniqueness. If either assemblage had a larger proportion of commonality with another set than the proportion of their uniqueness then the two assemblages were combined into a single unit. The commonality between components was also tested to confirm their distinctness. 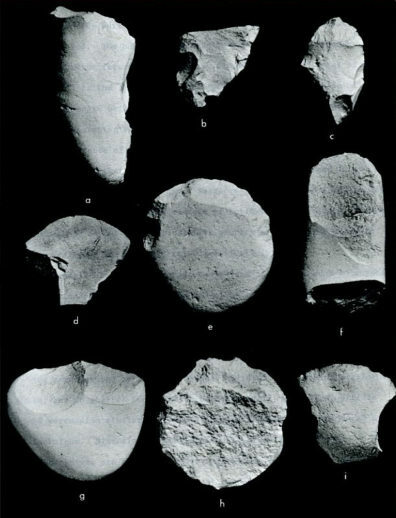 For this analysis artifact categories were not weighted by comparative value and it was assumed that classification of artifacts did not bias the comparison. 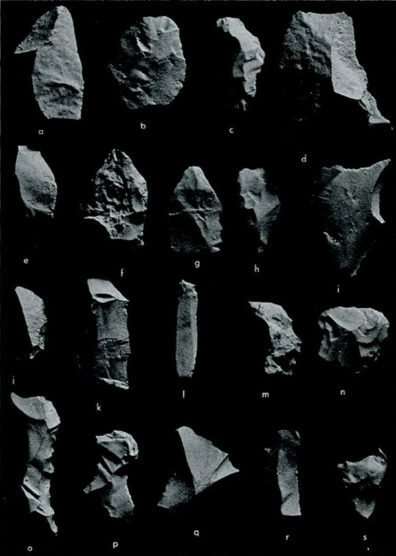 Some artifact categories, such as artifacts designated “unclassified” and cut bone, were removed for this analysis. Leonhardy asserted that this methodology not only worked well with small samples and limited inventory, but could also be used in cross-site comparisons. 1 408 C4 1 - 9,000-10,000 B.P. 3 (provisional) 46 C2 11b 5,000-7,000 B.P. 4 248 A5-6 5, 6 2,500-5,000 B.P. a-b. Category 1-1, uniface lanceolate; c-d. Category 1-2, biface lanceolate; e-g. Category 1-3, lanceolate with indented base; h-i. 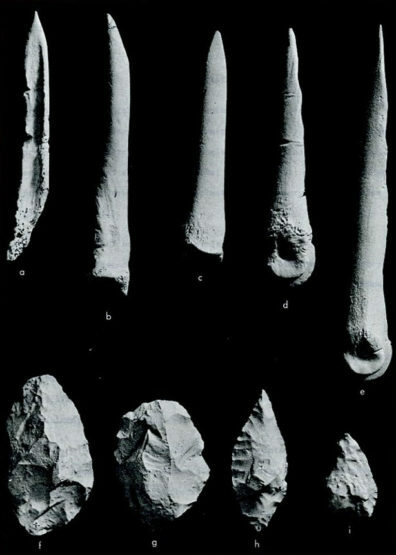 Category 1-4, contracting stem (one with graver tip); j-p. Category 1-5, shouldered and indented (specimens o and p are reworked); q. Category 1-7, expanding stem; r. Category 1-8, contracting stem; s. Category 1-9, straight stemmed; t. Category 1-6, weakly shouldered; u. Category 1-10, asymmetrical contracting stem; v. Category 1-11, fragment; w-x. Category 1-12, preforms. a-d. Category 1-13, lanceolate; e-f. Category 1-14, elongated lanceolate; g-h. Category 1-15, small lanceolate; i-k. Category 1-16, oval knife-like. a-d. Category 1-18, end scrapers; e-f. Category 1-19, denticulate scrapers; g. Category 1-20, stemmed scraper; h. Category 1-18, end scraper with utilized lateral edges; i-l. Category 1-24, burins. a-b. Category 1-24, burins; c-e. Category 1-25, burin spalls; f-h. Category 1-23, drills or perforators; i. Category 1-27, graver; j-q. 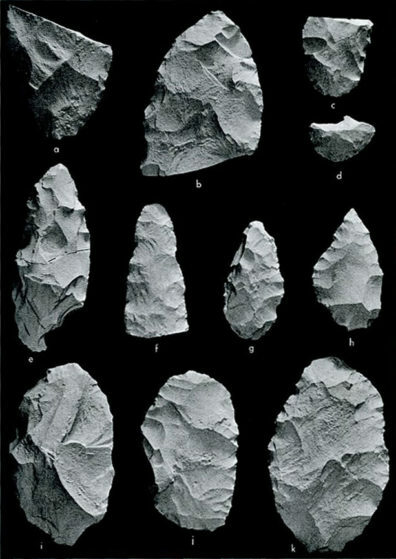 Category 1-32, prismatic blades, utilized flakes with straight or convex knife-like edges; r-s. Category 46, atlatl spurs; t. Category 1-48, fragment of worked bone; u. Category 1-47, tip of an awl-like implement. a-g. Category 1-32, with straight or convex knife-like edges; h-i. Category 1-33, with concave knife-like edges; j-n. Category 1-34, with steep, convex scraper-like edges. a-b. 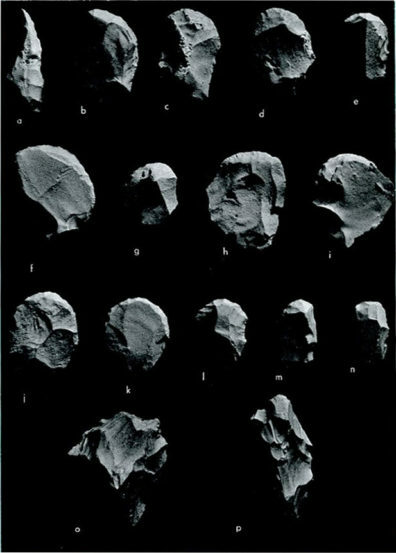 Category 1-36, with steep, concave scraper-like edges, Group 1; c-d. Category 1-37, with steep, concave scraper-like edges, Group 2; e-g. Category 1-38, with steep, concave scraper-like edges, Group 3; h-i. Category 1-39, serrated flakes; j-o. Prismatic blades with no definite indications of use. a. 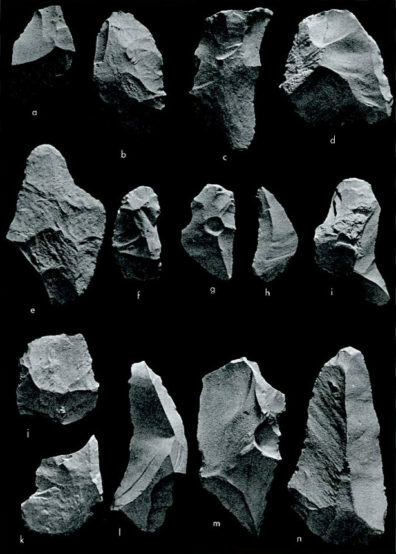 Category 1-21, cobble scraper; b-c. Category 1-26, biface fragments; d. Category 1-17, utilized cobble spall; e. Category 1-42, cobble chopper, Group 2; f. Category 1-43, cobble chopper, Group 3; g. Category 1-41, cobble chopper, Group 1; h. Category 1-40, cobble spall chopper; i. Category 1-22, cobble spall scraper. a-e. Category 2-4, knives, Group 1; f-l. Category 2-5, knives, Group 2.
a. Category 2-7, side scraper; b-n. Category 2-8, tabular end scrapers; o-p. Category 2-9, denticulate scrapers. a-h. Category 2-10, with straight or convex knife-like edges; i. 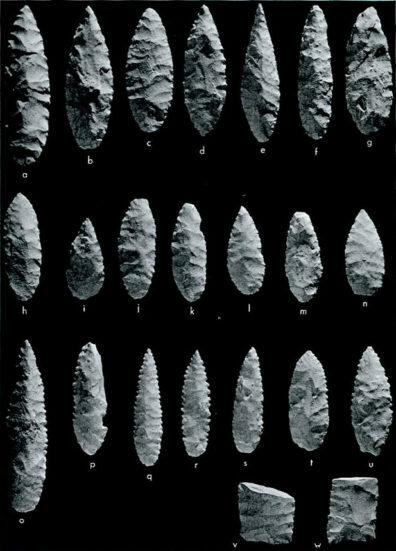 Category 2-11, with concave knife-like edges; j-n. Category 2-12, with steep, scraper-like edges, Group 1; o-s. Category 2-14, with concave, scraper-like edges. a-d. Category 2-21, cobble scrapers, Group 3 (cobble spall scrapers); e. Category 2-24, pounding stone, Group 1; f. Category 2-25, pounding stone, Group 2; g-i. 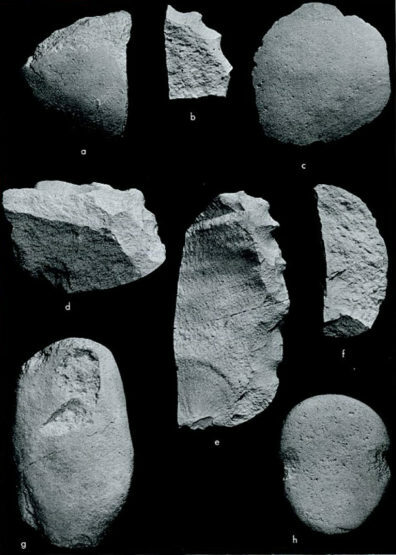 Category 2-28, denticulate cobble implements; j. Category 2-22, cobble scraper Group 4.
a-b. 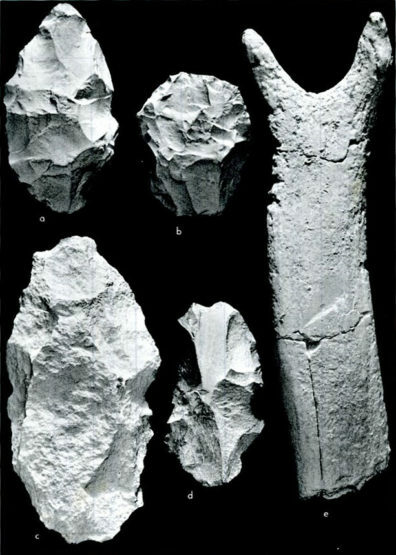 Category 2-29, knife-like biface; c-d. Category 2-42, examples of unclassified cobble artifacts; e. Category 2-32, possible antler digging stick tip. a-b. 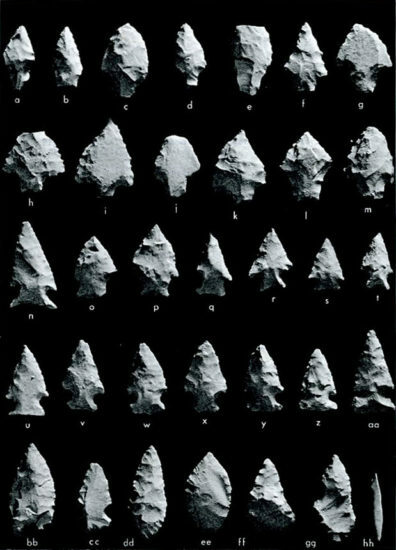 Category 3-1, lanceolate projectile points; c-d. Category 3-3, unfinished projectile points; e-g. Category 3-2, side-notched projectile points; h-j. Category 3-4, small lanceolate knives; k-l. Category 3-5, large lanceolate knives; m-n. Category 3-6, end scrapers; o. 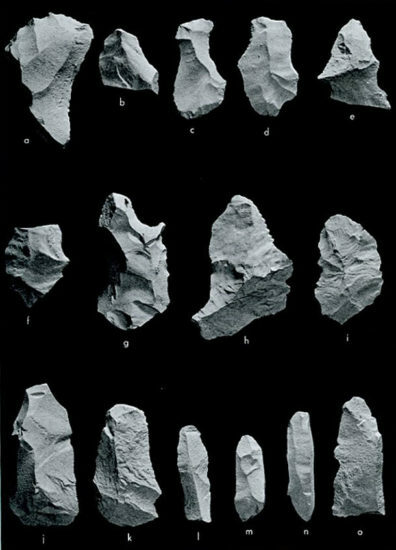 Category 3-7, knife-like biface; p. Category 3-8, graver. Associated Faunal Remains: deer, elk, antelope, coyote, rabbit, and numerous remains of fish, shellfish, and rodents. Whether the fish remains include the large salmonids was not established. a-e. Category 4-1, shouldered, stemmed, Group 1; f-m. Category 4-2, shouldered, stemmed, Group 2; n-y. Category 4-3, side-to-corner notched; z-aa. Category 4-4, side-notched; bb. Category 4-5, concave base; cc. Category 4-6, asymmetrical side-notched; dd. Category 4-7, lanceolate; ee. Category 4-9, indented base lanceolate; ff-gg. Category 4-11, unmodified triangular, or preforms; hh. Category 4-42, possible barbed bone projectile point. a. Category 4-27, cobble spall scraper; b, e. Category 4-28, serrated cobble spalls; c, f. Category 4-26, utilized cobble spalls; d. Category 4-33, cobble scraper; g. Category 4-30, pounding stone, Group 1; h. Category 4-36, notched pebble sinker. a. 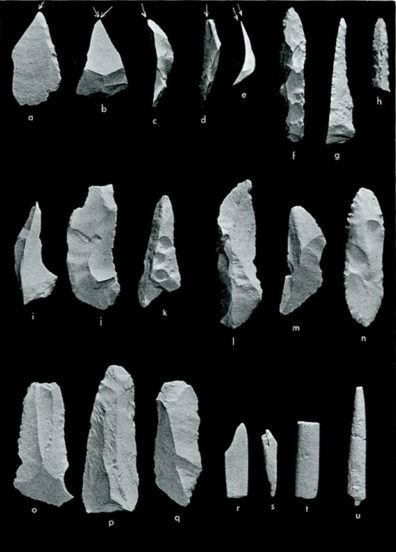 Category 4-40, splinter awl; b-e. Category 4-39, split bone awls; f-g. Category 4-25, preforms; h. Category 4-13, lanceolate knife or large projectile point; i. 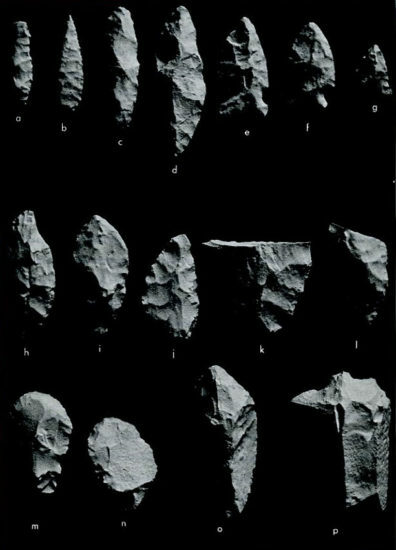 Category 4-14, knife or large projectile point. Associated Faunal Remains: deer, elk, bison (Bison bison) in addition to smaller mammals, river mussels, and unidentified fish. 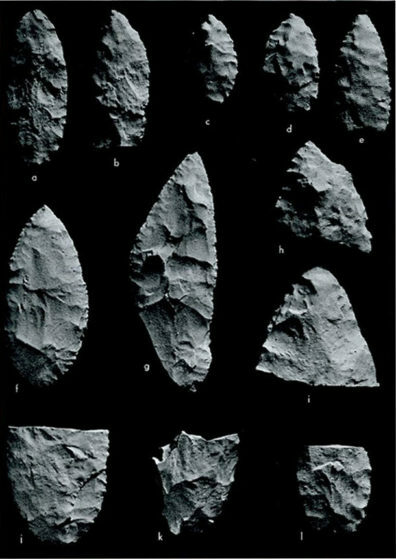 a-e. Category 5-1, basal-notched projectile points; f-h. Category 5-4, side-to-corner-notched projectile points; i. 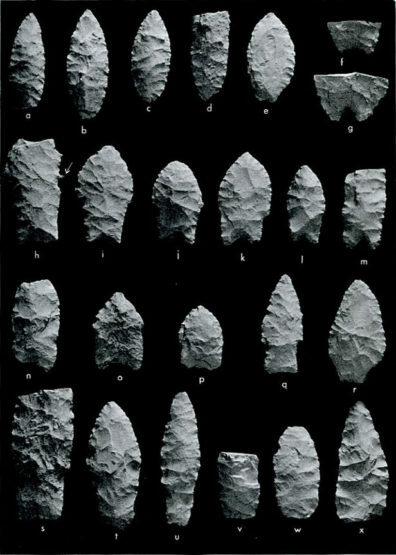 Category 5-6, asymmetrical projectile point; j. 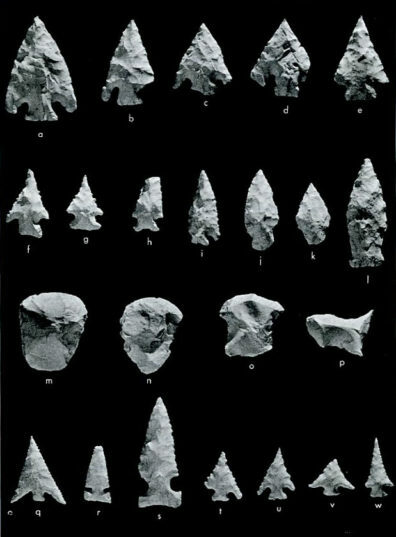 Category 5-7, asymmetical side-indented projectile point; k. Category 5-3, shouldered, stemmed projectile point; l. Category 5-8, side-indented projectile point; m-n. Category 5-11, end scrapers, Group 1; o. 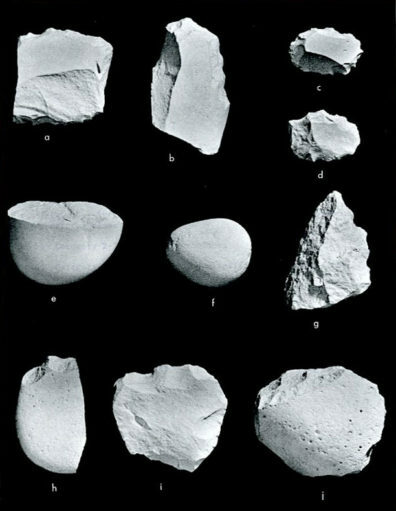 Category 5-12, end scraper, Group 2; p. Category 5-14, perforator; q-r. Projectile points from Assemblage A1; s-w. Projectile points from Assemblages C1b.